Alts? We Don’t Need No Stinking Alts! 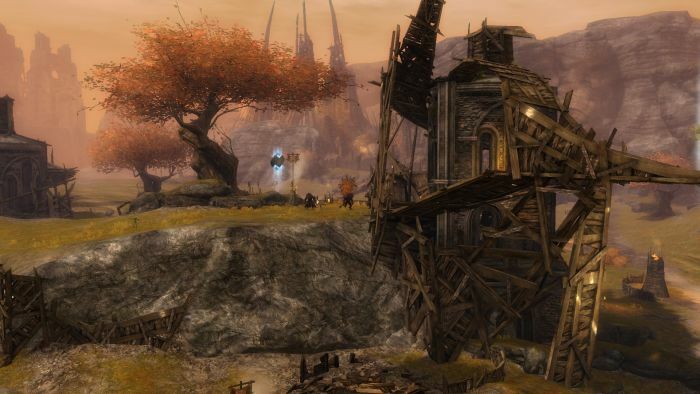 #GuildWars2 #GW2 – Nomadic Gamers, eh! Unable to bring myself to playing an alt when there’s still so much to do on my ‘main’, I’ve been completing the lower level zones and collecting craft goods for those unplayed characters so that they may at least level up crafting (and gain regular experience from that). So far it’s gone quite well. Yesterday I completed the Charr starter zone, which I found incredibly pretty, decked out in fall colours. My human mesmer picked up armoring and tailoring, which is of course a huge pain in the behind because both skills use the same materials to level up. I’ll get through it, I’ve really got nothing but time on my hands now that my guardian is 80 so collecting lower level supplies is not too rough. I’ve only completed two of the starter zones now, the Asura and Charr. Today I’ll probably do the human zones, and then the Sylvari tomorrow. We’ll see. That should get me enough craft materials to at least level either one or the other to 75, and prepare me for the next round of zones. I’m slowly saving up skill points towards the 200 required for the legendary weapon, and while I’m certainly not saving up any money (yet) I know it will come with time (or at least that’s what I hope). I’m pleased that I’ve almost completed the monthly achievements for September. All I need is to salvage 500 items, I believe at this moment I’m at around 375, and running through the lower level zones has certainly been helpful, as I’m just salvaging everything I loot. I’ve made sure to keep the magic find food active on my character too, after all every little bit helps. I hope everyone else is having a pleasant week so far, no matter what game you find yourself in. Happy gaming! I love how you are completing all the starting areas first, that is such an awesome idea. I attempted going back to do a low level place but once I am moving ahead I don’t want to go back!